The short story is about a little girl trying to escape an alligator who makes a deal with the devil: in return for being freed from the alligator, the girl must make clothes that the customers are forced to fit (this does not end well for most customers) After talking to a musician friend, who was also raised in East Tennessee, I think I probably got the idea for this story from him. But in his version, the customers are forced to act out something. In my version, the customers have to shrink or elongate or lose limbs or get smothered depending on their garments. Interesting difference, probably because he writes lyrics instead of drawing pictures and perhaps because I know how to sew and design garments. (There’s more on the dressmaker at “The Devil’s Dressmaker,” January 22, 2015). 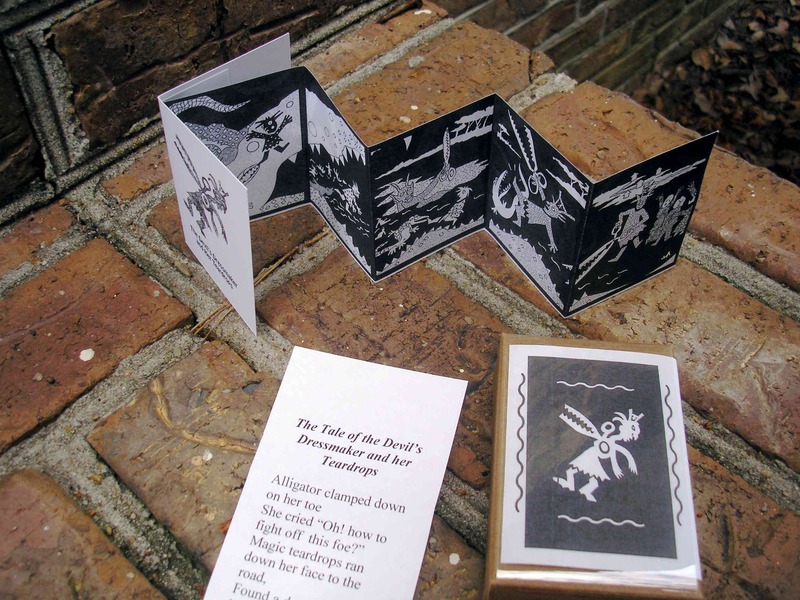 For the art-0-mat version, which must fit a box 2 inches by 3 inches, I designed a little accordion book and added a (rather bad) poem. I added teardrops to the story; when the little girl cries her tears run off and find the devil. Included in the box are little teardrop ladies. This project used up many of the plastic artificial teardrop containers that I obsessively collect. Now they have homes in Texas, Nevada and California, the states where I ask to have my stuff sent. Hot weather makes me lazy. Since finishing this mighty accomplishment, I’ve been playing around. 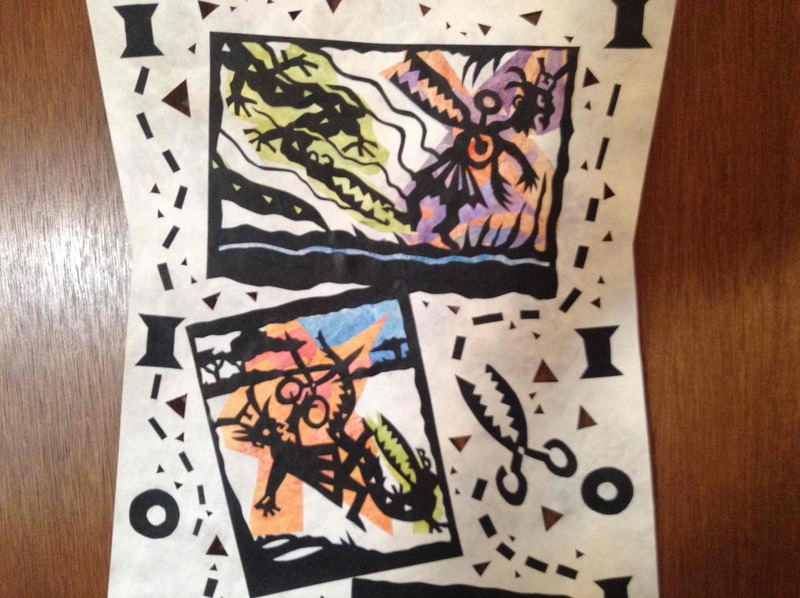 In June, I took a two week class on contemporary uses of traditional paper cutting, about which I will write soon. The classwork involved a lot of experimentation, and I made another version of the dressmaker so I’ll add that image here. The pieces are all hand cut from tyvek, my new favorite material. Finally, since the art-o-mat project involves an artist’s book, I’ve added a bibliography of my favorite book-art books. In early June, I did a workshop on artists’ books at the senior center in Boone NC and I handed it out there. 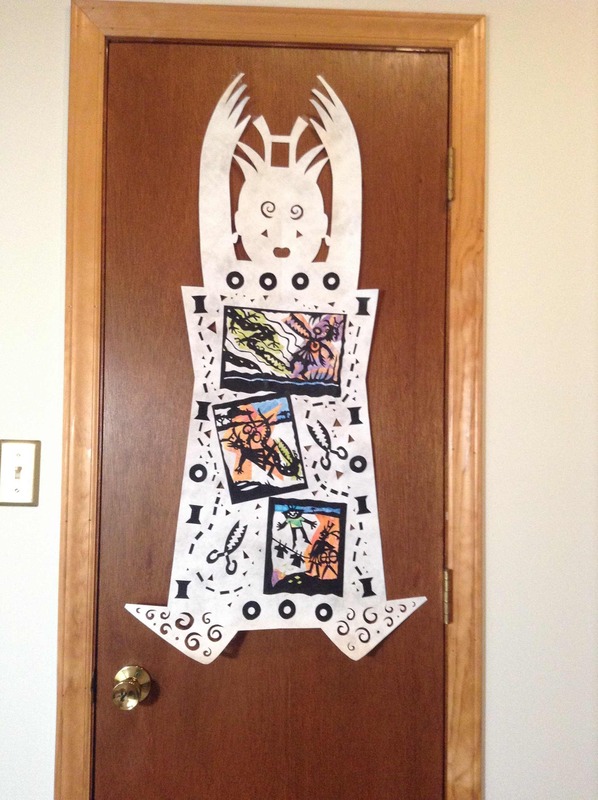 This entry was posted in The Other South and tagged art-o-mat, artist's book, the Devil's Dressmaker. Bookmark the permalink. 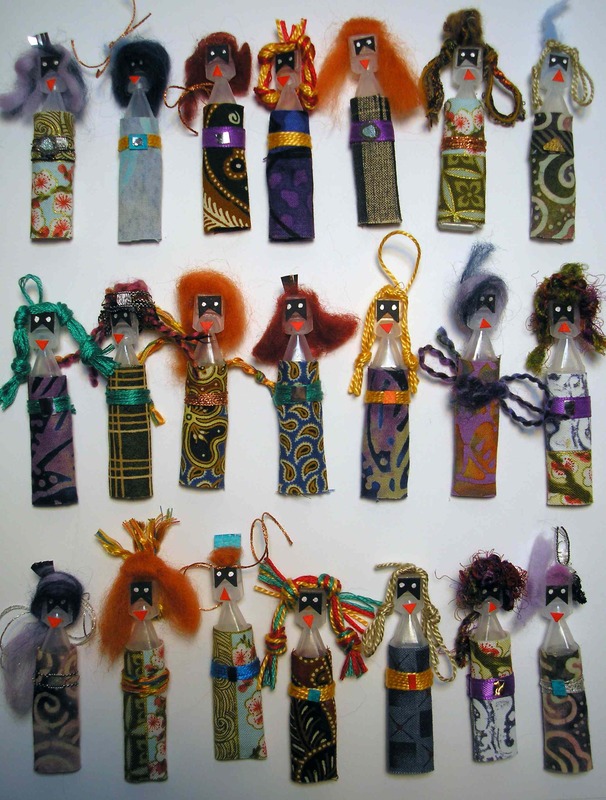 Nice update Linnie, the eyes on the mini-dolls are a big spooky, and the reading list appreciated. Looking forward to seeing how the new inspirations come together.